Japanese Episode AG 013: "Pokemon Kontesuto! Agehanto no Karei na Batoru!!" American Episode 285: "All Things Bright and Beautifly!" While entering Kanazumi City, Satoshi-tachi spot a variety of trainers training pokemon in unusual ways. They can't figure out what they're doing with their pokemon until two Coordinators, Megumi and Eiji, appear to explain that everybody is training their pokemon for the upcoming Pokemon Contest. The Pokemon Contest is a competition that places emphasis on a pokemon's beauty and skill rather than its ability to win a battle, and Haruka seems especially interested in the competition. 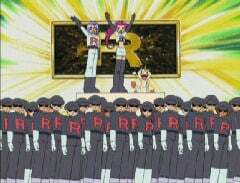 Satoshi-tachi are given tickets to watch the show as Eiji warns Satoshi that the Kanazumi City Gym Leader is a rock-type trainer. 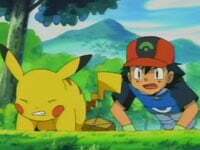 He tells the young trainer that he should have his Pikachu learn the technique 'Iron Tail,' so Satoshi trains with his pokemon as the contest starts. Musashi-tachi enter as well but are quickly disqualified, so the trio plans their revenge as Megumi and Eiji make it to the final round. Megumi and her Agehanto are eventually declared the winner, and before the contest ribbon can be handed out the Rocket-Dan appear to disrupt the contest. Satoshi tells his Pikachu to use 'Iron Tail,' but the attack fails. However, Megumi and Eiji's pokemon, along with Haruka's Achamo, are able to send the trio packing. Megumi is awarded the first prize ribbon as Satoshi-tachi rush to reach the first gym. Now THIS was a great episode. We get a very nice introduction of the Pokemon Contests, a bit of foreshadowing involving Haruka, and we get to see the first of the series' many moments of Satoshi training his pokemon to learn a particular move. Having Satoshi work for a few episodes (instead of just having him teach it to his Pikachu the episode of the Gym Battle) shows us that the anime producers are really trying and that they're not going to pull the same stunt they did with Satoshi's Gym Battle against Takeshi. As far as the dub goes, the translation itself remains good (as usual), but 4Kids got a little edit happy with this episode. 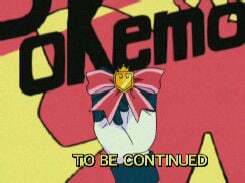 This episode now has the honor of being the most edited episode of the new series ("There's no Place Like Hoenn" used to hold that position) so far. I still find it amazing that a show as tame as Pocket Monsters needs to be censored at all, but such is the society we live in. Hey, guess what? The entire episode was zoomed-in on for like the fourth episode in a row. Is this a new series-wide edit or what? The sign on the building where the Pokemon Contest is held had the words "Pokémon Contest" (complete with the accent over the e!) written on it in English. 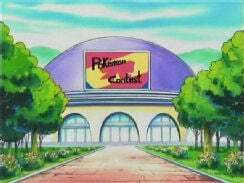 4Kids changed the sign to read "Pokémon Competition." Does anyone have any idea as to why they did this? I mean, they go throughout the episode calling them "Pokemon Contests," they're called "Pokémon Contests" in the games, yet for some reason they had to go and change the sign? I don't get it at all, but maybe it was just a warm-up for the next paint edit. You can view larger versions of these screenshots by clicking on each one. In addition to the paint edit, the sound effect of a large group marching in unison is taken out of the dub. 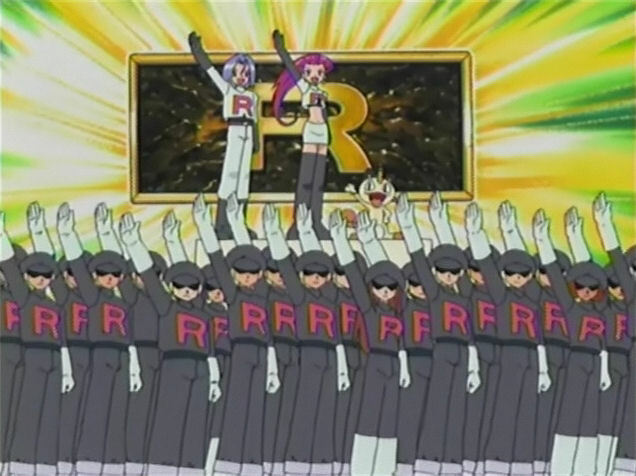 The only reason I can think of for the edit was because the stance the Rocket Grunts are holding looked too similar to the "Heil Hitler!" stance used by the Nazis during World War II. I don't see why 4Kids didn't just cut this shot instead of having to practically redraw the entire scene, but I guess they must have that much time to spare or something.. Right after the Contest M.C. 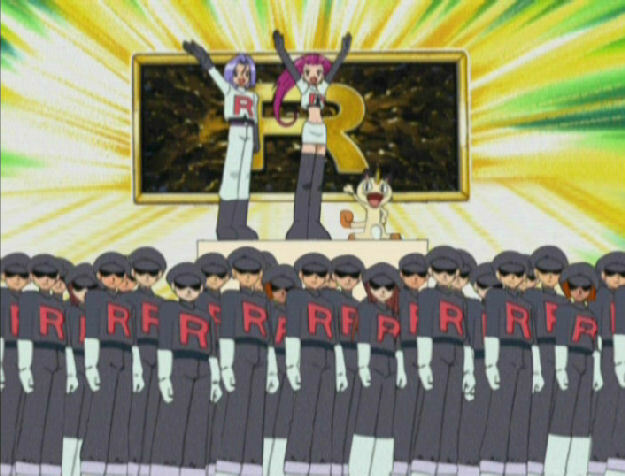 signals the start of the contest, a trainer throws a Monster Ball from which a Rougela (Jynx) emerges. Rougela then twirls around a few times before posing while everybody applauds. We then go to the scene with Megumi and Haruka talking. In the dub, we just see the announcement of the start of the contest, and then we see Janet and May talking. Here's a bunch of pictures I took from the scene. I actually predicted that this edit would take place, since Rougela is the black (no pun intended) sheep of the pokemon world. For some reason, the ellipsis (y'know, the "..." thing?) 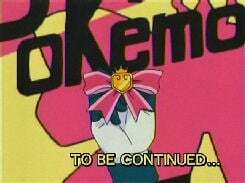 after TO BE CONTINUED is painted away in the dub. The stupidity of these edits never ceases to amaze me.